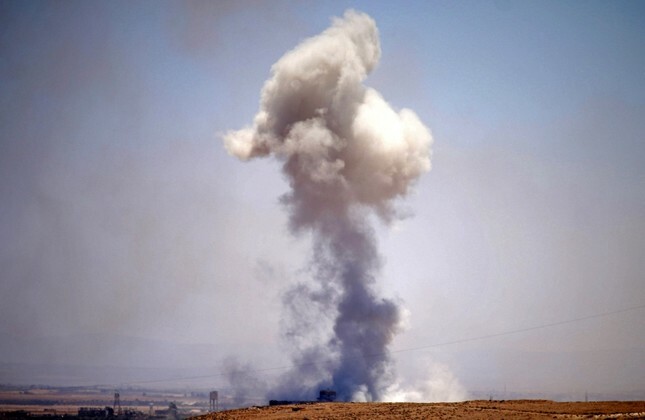 Assad regime jets struck opposition-held areas in the southern Syrian province of Daraa on Sunday, two days after a Russian-mediated ceasefire agreement came into force there, a monitoring group reported. The bombardment in the town of Umm al-Mayzan, in the south-eastern section of Daraa, left at least three civilians dead, the Syrian Observatory for Human Rights added. Warplanes and helicopters also struck the outskirts of Daraa, the capital city of the same province, the watchdog added, without giving casualty figures. At least 72 airstrikes have hit the areas since dawn on Sunday, it added. Syrian forces, backed by allied Russia forces, started a massive ground and air offensive in mid-June to retake Daraa from the opposition. The onslaught forced more than 320,000 people to flee and camp in open spaces or makeshift shelters near the border with Jordan or the Golan Heights. On Friday, the opposition in Daraa reached a deal with Russian military mediators whereby the opposition fighters agreed to hand over their weapons, in a major victory for Bashar Assad. Around 60,000 Syrians displaced by the regime campaign have returned home to Daraa during the past two days, according to the observatory. Others are reluctant to return to their homes in Daraa, now under regime control, for fear of detention or being forced into serving in the army.